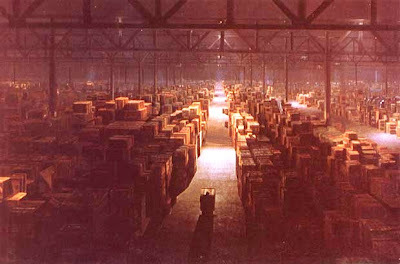 It looks like the same place that they stowed the Ark of the Covenant at the end of Raiders of the Lost Ark. It'd be great to see the Ark again... but I don't think they'll touch on it, aside from (if we're lucky), maybe a double-take on Indy's part as he passes a broken box with the Ark inside. That is typical Indy... going up against ridiculously silly odds...but it is so entertaining. My hopes are still there for the fourth installment. How about yours?